Status: Deceased; Active 1963-1974. Born: 1931-02-24. Died: 2010-05-21. Birth Place: Borovichi, Moscow. Graduated from Military Pilot School, Bataisk, 1952. Graduated from Air Force Military Academy, Monino, 1955 Colonel and pilot, Soviet Air Force. Cosmonaut basic training January 1963 - 21 January 1965. He was assigned for Soyuz 13, but he and his flight engineer Yazdovsky had personal differences, resulting in the prime crew being grounded and the backup crew flying instead. Forced out of the cosmonaut group on 28 June 1974 on political grounds. Worked at Gagarin Cosmonaut Training Center. Retired from active military duty in 1986. Family: Cosmonaut. Country: Russia. Flights: Soyuz sn 19, Soyuz sn 20, Soyuz Kontakt A, Soyuz 13. Projects: Salyut. Agency: VVS. Bibliography: 4452. 1931 February 24 - . Birth of Lev Vasilyevich Vorobyov - . Nation: Russia. Related Persons: Vorobyov. 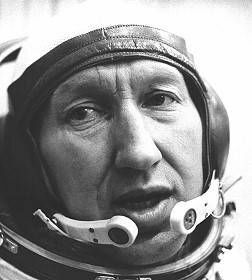 Russian pilot cosmonaut, 1963-1974..
1963 January 8 - . 15 new cosmonauts are selected. - . Nation: Russia. Related Persons: Artyukhin, Buinovski, Demin, Dobrovolsky, Filipchenko, Gubarev, Gulyayev, Kolodin, Kugno, Kuklin, Matinchenko, Shatalov, Vorobyov, Voronov, Zholobov. The new trainees include one from the VMF Navy Aviation, two from the PVO Air Defence, four from the RVSN Strategic Rocket Forces, and eight from the VVS Air Force..
1963 January 10 - . Soviet Air Force Cosmonaut Training Group 2 selected. - . Nation: Russia. Related Persons: Artyukhin, Buinovski, Demin, Dobrovolsky, Filipchenko, Gubarev, Gulyayev, Kolodin, Kugno, Kuklin, Matinchenko, Shatalov, Vorobyov, Voronov, Zholobov. The group was selected to provide astronauts for the Soyuz manned spaceflight program.. Qualifications: Military pilots, engineers, or navigators under 40 years of age; graduate of military academy or civilian university; under 170 cm tall; under 70 kg in weight..
1973 December 18 - . 11:55 GMT - . Launch Site: Baikonur. Launch Complex: Baikonur LC1. LV Family: R-7. Launch Vehicle: Soyuz 11A511. Soyuz 13 - . Call Sign: Kavkas (Caucasus ). Crew: Klimuk, Lebedev. Backup Crew: Vorobyov, Yazdovsky. Payload: Soyuz 7K-T s/n 33A. Mass: 6,560 kg (14,460 lb). Nation: Russia. Agency: MOM. Program: Salyut. Class: Manned. Type: Manned spacecraft. Flight: Soyuz 13. Spacecraft Bus: Soyuz. Spacecraft: Soyuz 7K-T. Duration: 7.87 days. Decay Date: 1973-12-26 . USAF Sat Cat: 6982 . COSPAR: 1973-103A. Apogee: 247 km (153 mi). Perigee: 188 km (116 mi). Inclination: 51.60 deg. Period: 88.80 min. A unique flight of the 7K-T/AF modification of the Soyuz spacecraft. The orbital module was dominated by the large Orion 2 astrophysical camera. The crew conducted astrophysical observations of stars in the ultraviolet range. Additional experiments included spectrozonal photography of specific areas of the earth's surface, and continued testing of space craft's on-board systems. 2010 May 21 - . Death of Lev Vasiliyevich Vorobyov. - . Related Persons: Vorobyov. Russian pilot cosmonaut, 1963-1974..